Julie is always well-versed in the sports and travel sections of our auctions — her favorites! 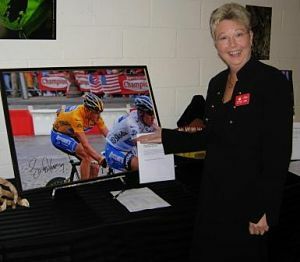 Earlier this year, auction team member Iris guest posed in my blog. Today, meet Julie. If you’ve ever spoken to Julie at one of our auctions, you know she’s got a wicked sense of humor! What you might not know is that she is a master at winning sweepstakes. Julie regularly wins stuff. Great stuff. Does anyone ever win those sweepstakes? They sure do! I’m living proof. After 20 years of service in the US Army, I retired at age 46. Since I was no longer keeping the world safe for democracy, I needed a hobby. I decided to enter sweepstakes. I would find a few to enter here and there and would occasionally win a T-shirt or key chain. That is not exactly what I had in mind. I found a couple of sweepstakes newsletters and subscribed. I soon learned that there are lots of people who enter sweeps in earnest, and those people were winning lots of cool stuff. The first “big” win for Julie was a trip to the US Open in New York, NY. Once I got serious about my new hobby, it began to pay off. Here are some of my favorite wins. 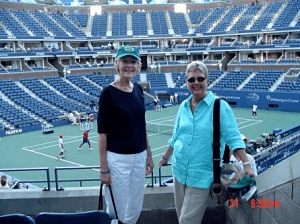 My first nice prize was a trip for two to the US Open Tennis Tournament in New York. My friend and I were flown to New York, met by a car and driver at the airport, and put up in a fabulous NYC hotel. A long white stretch limo took us to Flushing Meadow for the tournament. The sponsor of this sweeps was Heineken, and our seats were in the Heineken corporate box! We could reach out a touch the players. We could sit outside or inside in air-conditioned comfort and watch through the glass. We had two waiters who waited on us hand and foot with food and beverages. Plus, we had our own restroom. My next big win came from Cadillac. I won a walk-on part to a Broadway show last year! Julie’s debut on Broadway! 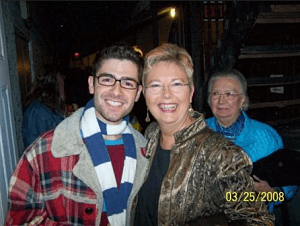 Here she is backstage with RENT’s Adam Kantor (a cast member). My scene was a group therapy scene in which everyone in the group says their name. I got to say my name and sing with the cast! Before going, I was called by the wardrobe lady who advised me on what clothes to bring so they could choose what I should wear. The prize also included round-trip airfare to NYC for four people, two rooms in a wonderful NYC hotel, and four house seats for my performance. Plus, my biography and photo was included in that night’s Playbill. I rehearsed with the cast 30 minutes prior to the curtain going up. They couldn’t have been nicer. I was seated in the wings next to the stage manager during the performance so I could watch him call the show. They wired me with a microphone and got me onstage for my scene. It was a full house and it went great. I was also brought out onstage at the end of the show for a solo curtain call. It was an experience of a lifetime. Shortly after returning from my Broadway debut, I was notified that I had won a trip for two to Hawaii. This trip was sponsored by American Airlines and included round trip airfare to Honolulu and five nights at the Hilton Hawaiian Village. We had a blast. Next I won a trip for two to London, courtesy of Orbitz which was promoting the James Bond movie, Quantum of Silence. 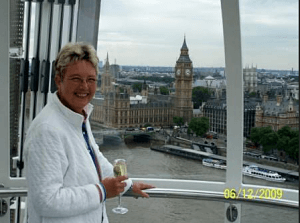 Enjoying the trip to London, champagne in hand in The London Eye. We were flown to London, met by a chauffeur driving a new Mercedes, and driven to the Grosvenor Hotel. We had tours to Hampton Court, Stonehenge, and Bath. We also got a champagne ride on The London Eye and dinner for two in the West End with tickets to a musical. We could choose when we wanted to go on the trip so I chose to go during the Queen’s birthday celebration. We watched the parade from Buckingham Palace and got to see Queen Elizabeth, Prince Philip, Prince Charles and Camilla, Princes William and Harry, Princess Anne, and all the other royals. It was spectacular. Last month, I won a trip for two to Paris, which was sponsored by Cinemark theaters and tied to the movie promotion Julie and Julia. The prize includes roundtrip airfare for two to Paris, six nights in a hotel and $2500 spending money. I can go anytime in the next 12 months. I think I’ll go this spring. I know from experience we’ll be treated well. So am I the luckiest person on earth? No. I really work at this. I consider it a job. I enter both online and via postal mail. I spend two hours a day entering online and a couple of hours a week doing mail entries. The hardest part is finding the sweeps. The newsletters are a great source for finding sweeps, plus I do my own research. I only enter the ones I want to win because the tax burden can be steep. You must pay income taxes on all your winnings. I read and follow the fine print of the official rules. If not, you will be disqualified. I enter consistently throughout the lifetime of the sweeps. I have had long dry spells when I don’t win big but just get the T-shirt and keychain. But when those big wins come in, it makes it all worthwhile. I love to travel and usually enter the ones that offer trips to places I want to visit. I have won many other nice prizes, but I won’t bore you with the details. I’ve got to get busy and enter more sweeps!